Whether you’re preparing for a distance race or a family cruise, completing a safety at sea seminar is probably the best investment you can make. Landfall, the nation’s leading marine outfitter and safety expert, is offering a US Sailing certified Near Coastal Safety@Sea Seminar at Mystic Seaport in Mystic, CT on Saturday, February 8. This hands-on seminar, moderated by Landfall President Captain Henry Marx, will provide novice and experienced mariners with the skills and information needed to safely navigate coastal waters from Long Island Sound to the Gulf of Maine. Joining Captain Marx is a panel of experts including Will Keene, President of Edson Marine; Captain Mark Bolonga, Lead Marine Safety Equipment Specialist at Landfall; Dr. Michael Jacobs, also known as “The SailDoc,” who has a private practice on Martha’s Vineyard and regularly speaks on shipboard medicine at offshore sailing courses; and Ralph Naranjo, Electronics Editor at SAIL Magazine and Technical Editor of Practical Sailor. Topics include Lessons Learned to Prevent Disaster; Damage Control; Emergency Pumps and Steering; Crew Overboard and Rescue Procedures (including PFDs, flares and distress calls); Medical Care and Prevention; Handling Heavy Weather; Life Raft; and other demonstrations. The seminar will be held from 8:30 am to 4 pm in The River Room at Latitude 41° Restaurant, which is adjacent to Mystic Seaport. The fee for reservations made before January 24 is $100 for Mystic Seaport members and $125 for non-members, and $125 for members and $150 for non-members after January 24. The fee includes all instruction and demonstrations, morning coffee and a buffet lunch. Participants will earn Official Near Coastal Safety at Sea Certification from US Sailing. For more information and to register, call Mystic Seaport at 860-572-5308 or log onto mysticseaport.org/event/safety-at-sea-seminar; or Landfall at 800-941-2219 or landfallnav.com/sasmystic.html. The Cruising Club of America’s Newport Bermuda Race Safety at Sea Weekend will be held at the Hyatt Regency Hotel on Goat Island in Newport, RI on Saturday and Sunday, March 15 & 16. Saturday’s events include a US Sailing-sanctioned Safety at Sea Seminar moderated by Ralph Naranjo, and the ISAF Offshore Personal Survival Refresher Course, which allows those with expiring ISAF certificates and other experienced sailors to acquire their certificate in one day. There will be exhibits by many organizations offering safety at sea services and products, and McMurdo grab bags will be presented to registrants for the Saturday seminar. A Practical Hands-On Training Session on Sunday, moderated by Dan O’Connor of Safescape, LLC, will combine with the Saturday seminar to yield the coveted ISAF Approved Offshore Personal Survival Course certificate. This certificate is highly recommended for the Newport Bermuda Race and required for the Rolex Fastnet Race and Rolex Sydney Hobart Yacht Race, as well as races in Mexico and Canada. All certificates are valid for five years. Other presentations include Hands-on Satphone Training with Jeff Thomassen of OCENS; Seasickness Prevention and Treatment with Dr. Jeff Wisch, Bermuda Race Medical Chair; Duties of the Boat’s Medical Officer/“Ship’s Doc” with Dr. Barbara Masser, Bermuda Race Physician; and Preparing Your Boat, Your Crew and Yourself, moderated by Kenyon Kellogg with presentations by Bermuda Race veterans including Nick Nicholson, Frank Bohlen, Robbie Doyle and Mike Keyworth. Fees vary depending on which presentations you wish to attend. To register, visit bermudarace.com. The Storm Trysail Foundation and New York Yacht Club in conjunction with the Maritime College of the State University of New York will host a Hands-On Safety@Sea Seminar at SUNY Maritime in Bronx, NY on Saturday, April 5, 2014. This US Sailing sanctioned seminar meets the Safety at Sea requirements for the 2014 Newport to Bermuda Race, and participants will receive certification from US Sailing. 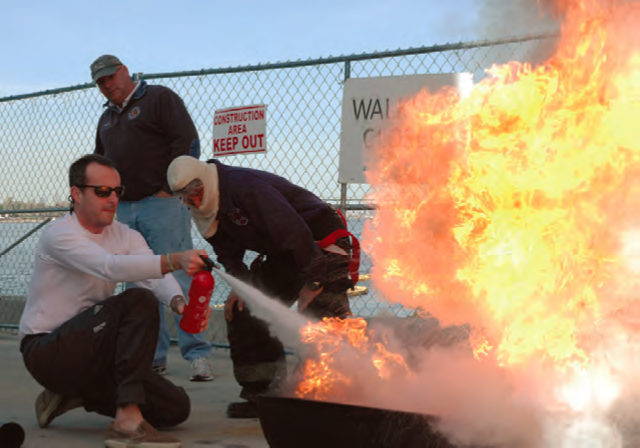 The curriculum includes an on-the-water session with man overboard recovery, setting storm sails and emergency steering; a pool session with PFD, life raft use and combating hypothermia; firefighting instruction and the use of flares and pyrotechnics; emergency communications; damage control, emergency medical treatment and much more. The $250 fee includes refreshments and lunch. To register online, log onto stormtrysailfoundation.org/safety-at-sea.htm and scroll down. For questions regarding the event, contact Butch Ulmer at Butch@uksailmakers.com. For questions about registration or payment, contact the Storm Trysail Foundation at info@StormTrysailFoundation.org.